The 2nd Global GypSupply Conference & Exhibition on global natural, synthetic and recycled gypsum supplies, sponsored by Eurogypsum, will take place in March 2020, once again in Brussels, Belgium. The 2nd Global GypSupply Conference will look at the different supply sources of gypsum worldwide, including natural gypsum, synthetic gypsum and recycled gypsum. Supplies of FGD gypsum will drop dramatically in the coming years as coal-fired power stations are progressively closed, and environmental and other regulations are curtailing the supply of some sources of natural gypsum. Some bulk gypsum suppliers are curtailing exports to focus on domestic markets. Recycling is becoming a potentially significant new source of raw materials. Given these changes in the markets, gypsum users (wallboard and plaster manufacturers, cement producers and agricultural users) are likely to seek new supplies and new suppliers of their crucial raw materials. 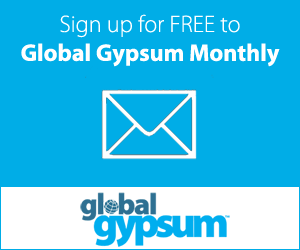 Global GypSupply Conference covers global gypsum supply trends, raw gypsum market dynamics (supply/demand trends), shipping and freight factors and legislative and regulatory factors in gypsum supply. The conference will include details of some of the world’s largest natural gypsum deposits that are now available for international bulk trade (for example in Canada, Mexico, Spain, Oman, Thailand and Australia) as well as smaller reserves and suppliers, as well as mining trends and technology. Buyers and traders of gypsum are expected to attend. The word’s largest gypsum producers in 2016, in size order, were: China, US, Iran, Turkey, Spain, Thailand, Japan, Russia, Mexico, Italy, Brazil, Australia, India, Oman, Saudi Arabia, France, Algeria, Germany, Canada and the UK. Data from Statistica. The Global GypSupply Conference will additionally cover the global synthetic gypsum supply and demand situation: While FGD gypsum production in Europe and the US is dwindling, Chinese and Indian production may increase - but will be in the wrong place for many users. Other synthetic gypsum supplies (fluorogypsum, phosphogypsum, titanogypsum, citrogypsum) are out there - and the event will help in linking supplies of quality synthetic gypsum with potential users. Around 100 - 150 attendees are expected from around 35 countries, as well as up to around 15 exhibitors (including gypsum miners, suppliers, traders, recyclers and equipment producers). Networking and business opportunities will be built into the programme, as well as a memorable social evening that is not to be missed. In summary, the event will look at the supply of gypsum up to the factory input gate. Everyone concerned with supplying, buying and using gypsum should attend! The conference early-bird registration fee is £595 until 25 November 2019 and the normal rate is £695 from 26 November until 10 February 2019. The conference late-rate registration fee is £795 after 10 February. Speakers register for £295. The conference dinner is bookable separately at a rate of £95. Rates exclude 21% Belgian VAT and any additional applicable local taxes. The first Global GypSupply Conference has successfully taken place with 110 delegates from 28 countries gathering in Brussels to hear 20 presentations over two days, alongside six exhibitors, with one very unusual 'walking' dinner at the Atomium! Delegates agreed that the event had been extremely useful in terms of technical content and for networking and business, and so the 2nd Global GypSupply Conference and Exhibition on global gypsum supply will take place in spring 2020, at a location yet-to-be-determined. See you there! Another great conference, thank you! I appreciate how you continually improve your conferences.